The next Chattie sharif day falls on: 6th, Zil–Hajj 1439 , This is on Approx: Saturday 18th or Sunday 19th August 2018 (On Saturday in Ajmer Sharif Dargah). Accuracy is Dependant on the Lunar date of your country. Qurbani orders are still being taken, Please contact any of the given details below to book your Qurbani in Ajmer sharif Dargah! This Fathia (Tribute / Commemoration Prayer) of Bibi Fatima-al-Zahra (R.A) will takes place in Ajmer Sharif on the above date. Fatimah (R.A) was the beloved daughter of our dear Prophet Muhammad (PBUT) and Khadijah(R.A), Fatimah (R.A) was the wife of Ali (R.A) and mother of Hassan (R.A) and Hussein(R.A), and one of the five members of Ahl al-Bayt..
She became the object of great veneration by all Muslims, because she lived closest to her father and supported him in his difficulties and because of historical importance of her husband and her two sons, and that she is the only member of Prophet Muhammad’s (PBUT) family that gave our beloved prophet descendants, numerously spread through the Islamic world. For Muslims, Fatimah is an inspiring example and Fatimah is one of the most popular girl’s names throughout the Muslim world She died a few months after her father’s death, and was buried in Jannat Al-Baqi’, but the exact location of her grave is unknown. Fatimah (R.A) was born in Mecca to Khadija, the first wife of prophet Muhammad (PBUT). Fatimah(R.A) is given many titles by Muslims to show their admiration of her moral and physical characteristics. The most used title is “al-Zahra”, meaning “the shining one”, and she is commonly referred to as Fatimah Zahra. She was also known as “al-Batul” (the chaste and pure one) as she spent much of her time in prayer, reciting the Qur’an and in other acts of worship. According to tradition, on one occasion while Prophet Muhammad (PBUT) were performing the salah (prayer) in the Kaaba, Amr ibn Hishām (Abu Jahl) and his men poured camel placenta over him. Fatimah (R.A), upon hearing the news, rushed to her father and wiped away the filth while scolding the men. اللہ پاک آپکی جان ، مال ، ایمان ، آبرو، روزی ، رزق, علم ، عمل گھر، کاروبار ، دسترخوان ، اولاد، زندگی , عبادات ، تقوی، اخلاص، اخلاق ، سادگی، عاجزی، انکساری اور عمر میں برکتیں، رحمتیں . وسعتیں، رفعتیں، اور عروج و بلندیاں عطاء فرماۓ. اپنی خاص رحمت وبرکت نازل فرماۓ. Begins from 18 th March to 27 th March 2018. If you would like to come to Ajmer Sharif to the annual Urs of Hzrt Khwaja Moinuddin Hassan Chishty (R.A), please inform me at once inorder, for preparations can be made for your visit. Such as accomodation, transportation, food provisions..etc, while your stay in Ajmer. If for some reason you are unable to attend the Annual Urs in person then you can participate by contributing towards the Urs Sharif (Nazr-O-Niaz) by donating any amount via Western Union or Money Gram. Or you can deposit your amount into my account given below and let me know by phone or Email. Remember in future,if you would like to take part by making an offering for Fathia, Nazar-o-Niaz, Qurbani,or Gyarmee ,Chattie fathia sharif or you would like to take part in Urs of Wali-Allah’s (All Sufi Saint’s from all Silsila’s); you can send your heartily offerings & donations direct to us safely now! or in the future. You can put you donations to these causes in the following account your self in person. This the most safest method. It is a request of all faithful devotees & whoever else so wishes to contribute to the Dargah sharif, to safely deposit in the above account. Also in the Mosque inside Darbar Sharif we can arrange for Dua-e -karima, khatam-e- khwajgan, Dua-e-Shifa,Ayate karima and similar dua’s on your behalf . We can arrange for food to be made in Big deg & Small deg at Darbar . You can also participate in part contribute towards these degs by contributing a small amount of what ever you can afford. 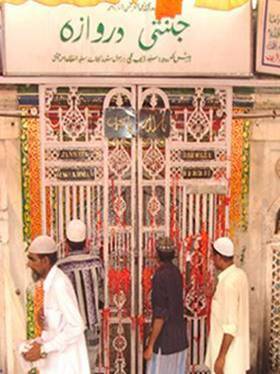 Do not give donations to any collectors on the streets or those who come knocking on your door in the name of Ajmer Sharif. These are not genuine people. If your “Wish” (Mannat) has come true then, do not delay in fulfilling your ‘Thanks giving’ in return (Mannat Uttarna), this is very important. If you would like to make a “Wish” (Mannat) in Ajmer Sharif & are unable to attend in person then contact me in the first instance. I will personally tie your ‘Wish string’ in the Dargah sharif for you. Haji Peer Syed Farough Ahmed Chishty Niazi Gaddi nashin & Cheif Moullim Khwaja sahib dargah Sharif,Po box no 6 , Ajmer 305001 India. We also provide Free ancient Sufi healing for all aliments relating from I’ll health to unsuccessful business , Education, driving Exams. ★PROFESSION :- Business man, then a Prophet. 10 MIRACLES YOU MUST KNOW ABOUT PROPHET MUHAMMAD(S.A.W)!(S.A.W)!!(S.A.W)!!! 1o Do you know that he has no “shadow” even in the “Sun”, Moon or “Light”?(S.A.W). Even if you did not share , you will be rewarded, but if you do, your reward will be unmeasurable!! !